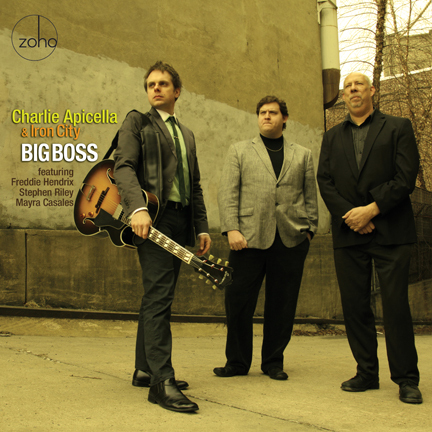 On Big Boss, their third offering and debut ZOHO CD release, Charlie Apicella & Iron City renew the traditional organ group sound. Rife with swing, up-tempos and ballads, each song has its own story and groove. Of the eight tunes, four are penned by Apicella, the other four are covers of Grant Green, Willie Dixon and not-oft-instrumentally-heard MoTown classic by Holland-Dozier-Holland. Sheila Anderson: How did you come to name the band Iron City? Was it a nod to Pittsburgh? SA: What is your connection with Yusef Lateef? SA: Describe your guitar playing. CA: I take great pride in my guitar tone and I strive for a direct, thoughtful approach to improvisation. From the masters I have learned that a solo isn't only about the individual, it must also enhance the groove, progress from beginning to end and tell a story. I try to play with clarity and lay down some listenable, digestible, soulful ideas. I can learn something from any solo I hear. The important thing with most of these masters is that they are great composers as well as improvisers. CA: I often compose from the ground up, with a feel or rhythm pattern as my first influence. For this record, having two horns to work with was a new frontier for my writing. I am blessed to have a front line complemented with two of the most distinctive voices on the scene in Freddie Hendrix, trumpet, and Stephen Riley, tenor saxophone. As for Amalfi, I wanted to do one where I was not featured playing the melody - it is played by violin and tenor sax. My chordal style is understated, so it was a perfect opportunity for me to lay down some lush chords and write an intricate arrangement of the melody. It is a lyrical line and I carefully crafted the way Amy Bateman’s violin dominates and Stephen perfectly envelops her sound with his counter-melody. His sound on tenor sax is remarkable, so it was an opportunity to write in the way Duke Ellington and Billy Stayhorn would adapt arrangements for the unique sounds of their musicians. SA: Regarding arranging, how did you and Alan Korzin come to work together? CA: Alan and I have played close to 1,000 gigs together over the past several years. The band's sound, approach to feels, tempos and grooves is the result of our attention to detail. It is important for us to base our work on sounds from the past, keeping true to tradition. With that firm foundation, it is easy to forge new ground and carve out our own group sound. For this sextet, I found myself writing for the front line of guitar with both horns while he, the rhythm section leader, conveyed our concept and approach to Dan Kostelnik on organ and Mayra Casales on congas. SA: As for the music, what was your approach to “I Hear a Symphony”? CA: This arrangement is my hats off to Charles Earland. He was the best at marrying a pop tune with tried and true organ feels and jazz chord progressions. SA: Your tune, “Idris” has a very percussive sound that takes me back to the time when Jazz was the popular dance music. Alan Korzin: Idris Muhammad is one of Iron City's greatest influences. The bass line of the tune is inspired by Idris' signature ride cymbal pattern that he employs on almost every funk tune he recorded. Charlie and I wondered why he always seems to reference that rhythm, so I began to dig deeper into the origins of funk drumming. The foundation of this sound is a traditional Native American rhythm that predates New Orleans drumming by centuries. The drummers of New Orleans kept this rhythm alive and Idris adapted it for the organ music of the 70's. SA: Charlie, tell me about the other songs on this record and why you chose to end with “Sunday Mornin’”, which I think is a perfect choice. It's easy to hear polyrhythms in a 6/8 feel and Dan Kostelnik nailed this one the minute I presented it to the band. He plays a wonderful intro on it and really keeps it in the pocket. I woke up with this tune fully formed and running in my head early one morning after seeing Sonny Fortune at The Blue Note. It is my tribute to all the Bosses. It also has some Wes, Coltrane and Larry Young in there. The vamp for the A section is something you might hear McCoy Tyner play while the B section is a descending melody with Wes Montgomery style chord voicings. My dad and two of his older brothers, Guy and Anthony, are the inspiration for that one. My dad loves blues and Muddy Waters in particular, who recorded many of Willie Dixon’s compositions. I superimposed a chord progression over this one which is originally a vamp on one chord, recorded by Howlin' Wolf. The chords lend themselves to a big band type arrangement with the horns and my guitar in a call and response, in the style of BB King. This has been one of my favorite Grant Green compositions from before I was even a musician. The rhythm section lays down a nice New Orleans second line/ Brazilian hybrid feel. That tune is a statement to end the record with! 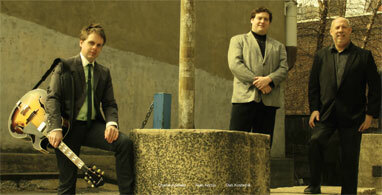 I wanted to feature Stephen Riley and Dan on that because they both play Gospel so well. I feel it's important to end on a bright note; Sunday is the first day of a new week and this record is signaling more to come from this great band. All music arranged by Charlie Apicella. "Idris" arranged by Charlie Apicella and Alan Korzin. Produced by Charlie Apicella and Alan Korzin. Recorded, mixed and mastered by Chris Sulit, Trading 8s Recording Studio, Paramus, NJ. Photography, Art Direction and Package Design by Jack Frisch. Executive Producer: Joachim "Jochen" Becker.